In 1999, we began brewing beer in Lucan, Minnesota population 220. It was a very small setup, with a smaller brewing area than the footprint of the fire truck. With a two bbl system, we struggled to keep up production despite the fact that all of our beer was consumed on premise. In time we simply grew with the craft beer industry. Soon after start up, we started filling growlers as the law allowed. We also graduated from simple gateway beers, (Pale Ale, Pilsner, Strawberry Wheat) to more complex and flavorful ales and lagers. Seasonals came and went, and over time we learned through trial and error, with indispensable help from our friends and guests. In 2006, Brau Brothers Brewing was born, and we moved our production to the red shed on the edge of Lucan. A bottling line was added to our newly minted 15 bbl system and we were in business. We soon began distributing to the nearby area. The next spring, a hopyard and barley field were added to brewery. Estate beers were then mixed in with a stable of year round and seasonal beers. In 2013, we made another move, this time to Marshall Minnesota. A taproom was added to the brewery, and the additional space allowed us to expand our distribution area. 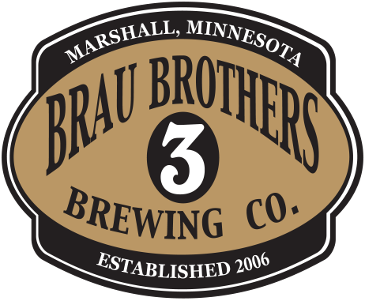 Today we proudly distribute Brau Bros Beer to the upper midwest, as we continue to build our team, learn as much as we can about beer, and enjoy spending time with our fellow beer lovers!